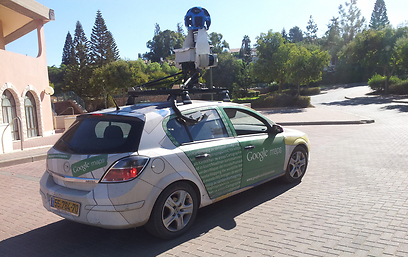 Web surfers will soon get the opportunity to take a closer, 3D look at the Israeli-Palestinian conflict, as Google Street View cars have begun touring and taking pictures of West Bank settlements in recent days. In the following picture, a Google Street View car is seen touring the community of Elkana on Monday. The American search-engine giant launched its Street View service in Israel in April, starting with the cities of Jerusalem, Tel Aviv and Haifa. Different universities across the country have recently been added to the service. 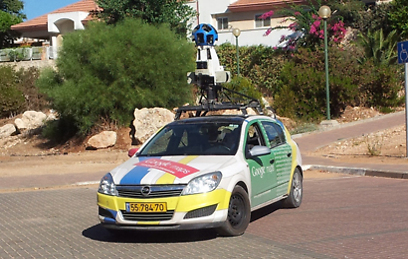 Up until now, Google avoided crossing the Green Line and capturing images in Jewish settlements, but in recent days Street View cars have been spotted in the communities of Elkana, Sha'arei Tikva and Oranit and in the city of Ariel. According to the company's statement, additional cities expected to be photographed by Google are Kfar Saba, Modiin, Maccabim-Reut, Rishon Lezion, Petah Tikva, Kiryat Ono, Netanya, Rehovot, Haifa, Beit Shean, Majdal Shams, Katzrin, Afula, Carmiel, Ma'alot-Tarshiha, Dimona, Beersheba, Rahat, Kiryat Malachi, Ashdod and Eilat. The drivers operating the Street View car in Elkana told passersby they were forbidden to disclose their destination and were ordered not to enter illegal outposts. They added that, as far as they knew, Google did not intend on providing them with fortified cars in case of stone-throwing or a terror attack. The Israeli Law, Information and Technology Authority at the Justice Ministry's authorized Google to operate its camera cars as long as the company "provides the public with general information on its planned route on the Internet and in the press." The city of Ariel does appear on the Street View page on the Google website, but the other communities do not. The settlement residents were pleased with the Google car's visit. According to Amit Dekel of Elkana, "This is just another step in turning the communities into a legitimate and normal place like all other places. This is very good news. Moreover, it gives us a sense of America, and that’s always nice." Despite the optimism, it is unclear which state the communities will be attributed to on the Street View service. In the company's maps, the territories do not appear under Israel and are separated from Israeli territory by a dotted line. The settlers will likely not approve of their communities being defined as belonging to the Palestinian Authority. Google did not provide a specific comment on the cars touring these communities and others. The company's spokesman in Israel said in response, "We aspire to bring the Street View service on Google maps to as many countries and areas as possible, including in Israel and the Middle East. "As a technology company, we focus on providing the best service to our users." See all talkbacks "Google cameras cross Green Line"